This book provides a comprehensive compilation of essays on the relationship between formal experimentation and ethics in a number of generically hybrid or "liminal" narratives dealing with individual and collective traumas, running the spectrum from the testimonial novel and the fictional autobiography to the fake memoir, written by a variety of famous, more neglected contemporary British, Irish, US, Canadian, and German writers. Building on the psychological insights and theorizing of the fathers of trauma studies (Janet, Freud, Ferenczi) and of contemporary trauma critics and theorists, the articles examine the narrative strategies, structural experimentations and hybridizations of forms, paying special attention to the way in which the texts fight the unrepresentability of trauma by performing rather than representing it. The ethicality or unethicality involved in this endeavor is assessed from the combined perspectives of the non-foundational, non-cognitive, discursive ethics of alterity inspired by Emmanuel Levinas, and the ethics of vulnerability. 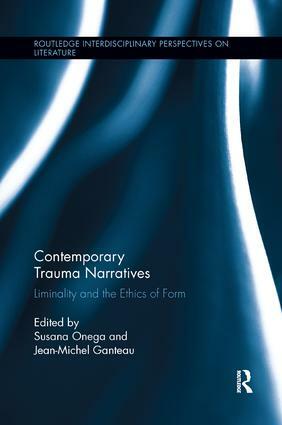 This approach makes Contemporary Trauma Narratives an excellent resource for scholars of contemporary literature, trauma studies and literary theory. Susana Onega is Professor of English at the University of Zaragoza, Spain. She is a member of the Academia Europaea, a former Honorary Research Fellow at Birkbeck College, and the Head of a research team currently working on ethics and trauma. Jean-Michel Ganteau teaches British literature at the Université Montpellier 3, France. He is the main editor of the journal Etudes britanniques contemporaines and the co-editor of the ‘Present Perfect’ series (PULM).